Corporatism didn’t evolve naturally. The landscape on which we are living – the operating system on which we are now running our social software – was invented by people, sold to us as a better way of life, supported by myths, and ultimately allowed to develop into a self-sustaining reality. It is a map that has replaced the territory. Rushkoff illuminates both how we’ve become disconnected from our world, and how we can reconnect to our towns, to the value we can create, and mostly, to one another. 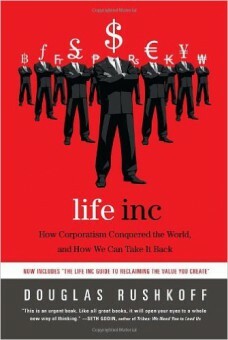 As the speculative economy collapses under its own weight, Life Inc. shows us how to build a real and human-scaled society to take its place. In Life Inc., Douglas Rushkoff presents the unnerving, unbelievable, but ultimately undeniable proof that our world has been overtaken by an absolutely artificial economy. He shows how our most fundamental assumptions about money and commerce are actually false ones – artifacts of a 400-year-old plan by a waning aristocracy to maintain control of Western Europe. Although the architects of this corporatism have long since passed on, we still live in a landscape defined by their plans and have internalized their values as our own. Banking is our society’s biggest industry, and debt is our biggest product. The development of chartered corporations and centralized currency caused the plague; the economic devastation ended Europe’s most prosperous centuries, and led to the deaths of half of its population. Most importantly, Rushkoff shows how this moment of financial crisis is actually an opportunity to reinstate commerce and communities based in creating value for one another, rather than continuing to extract it for the benefit of institutions that no longer exist.